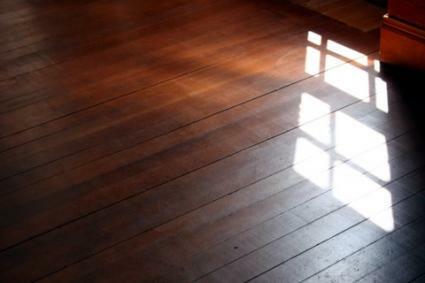 The following tips on how to refinish hardwood floors will make the job easier and safer. Although hardwood can last a lifetime in your home, it will eventually need refurbishment and possibly refinishing. Dirty floors can be cleaned with a wood detergent, and you can often bring back their natural shine with a little elbow grease. Floor buffing equipment, available for rent at your local home improvement store, is good at removing wax buildup and dirt, but if the finish itself is stained, discolored, or damaged, the floor will have to be refinished. The process of sanding your floor will remove some of the wood, and to ensure that the depth of the wood on your strip, parquet, or laminate flooring is thick enough to stand standing, expose the edge of the wood by removing a baseboard or vent cover to evaluated its thickness. You will be able to sand down to the tongue and groove of the floor but no deeper. If the floor is a thin laminate, or has been refinished before, the job should be done by a professional. In order to refinish your wood floor, you will need a sander, wood putty, wood stain, fine steel wool, varnish, painter's tape, a putty knife, hammer, plastic sheeting material, an electric fan, respirator, protective eye gear, shop vacuum, lint free cloth, applicator pads, broom, paintbrushes, and rags. Vibrating sanders are a good choice for floors that are relatively flat and free of dips or gouges. Using sandpaper on a flat pad, a vibrating sander oscillates to create the friction necessary to remove the old wood finish. Handheld units appear convenient and easy to manipulate, but larger, heavier, floor models are easier to control. Drum sanders are a better choice when there is damage to the wood, like deep gouges or scratches. Drum sanders are powerful tools that take some getting used to. Often training classes are available to help get you started. Either professional training or some practice is a good idea to minimize the chance of accidentally damaging your floor. Sanding corners and edges will require a special sanding tool. Edge or random orbit sanders are typically used for the job, and an edge sander is often included in an equipment rental combo designed for floor refinishing. Parquet flooring requires special treatment because the grain is going in so many different directions. In order to refinish a parquet floor, use a special orbital floor sander or leave it to a professional. Remove all furniture and carpet from the floor and then carefully remove the floor molding (quarter round) and baseboards. Avoid damaging baseboards by placing a piece of scrap wood over the baseboard to protect it as you pry up the floor molding. Set baseboards and floor molding aside. Cover doorways and vents with plastic sheeting material, sealing it in place with painter's tape. Walk carefully over the floor, making a note of the places where you encounter squeaks and protruding nails. Nail eight-inch finishing nails into squeaky boards, setting and filling them with latex wood putty. Set and fill any protruding nails. Walk carefully over the floor a second time to make sure you have eliminated all of the squeaks. Whether you are a working with a vibrating sander or drum sander will determine how you proceed with the project. As drum sanders are usually used when there is damage to the wood, you will typically begin sanding with coarser grit sandpaper. 36 to 40-grit sandpaper is a good place to start, although the instructions that come with the sander can provide you with additional information on grit recommendations. The coarser the sandpaper you use, the lower the grit number. You will typically complete the project with fine finishing sandpaper of 80 to 100-grit. If you are using a vibrating sander, you will start with a higher grit sandpaper (60-grit to start). Never start your project without making sure that you are wearing a dust respirator and protective eye gear.Always sand with the grain of the wood, moving the sander so that it travels along the length of the boards following the pattern of the floor. Work in back-and-forth motions over a three to four foot area, overlapping your strokes as you go. When you finish the main area of the floor, use the edge or random orbit sander to get into corners and other areas you were unable to reach. If you haven't used this type of sander before, practice on a piece of plywood or an inconspicuous area of the floor before you begin work. It can take a few minutes to get a feel for how to grip and move the sander, and feeling comfortable with the way it handles will be important in getting a good even finish. Sweep the floor thoroughly between sandings, and carefully vacuum up any residue. Grit that rubs off sandpaper can scratch the floor and ruin the smooth finish you are trying to achieve. Always take a few minutes to make sure the floor and your clothes are free of grit and dust before you continue to the next step. If you are planning on applying stain to the freshly sanded floor, make sure that you do a thorough cleaning job by vacuuming and going over the floor with a tacky cloth first. Apply stain with a foam applicator pad or paintbrush according to the manufacturer's instructions. Work in small manageable areas no more than four feet square, and only stain in the direction of the grain. Remember the motto, "less is more", and don't overload your brush or pad. Remove any excess as you go using paper towels or a lint free cloth. Once the stain has dried as recommended, apply a polyurethane finish to the floor, and then sand it lightly with 220-grit sandpaper or fine steel wool. It will take three to four layers of clear finish to complete the job, giving each coat an opportunity to dry between applications. Both oil-based and water-based polyurethane varnishes are available, and different manufacturers require different drying times. When learning how to finish hardwood floors, always give yourself plenty of time, and make safety a top priority. Oil soaked rags are a fire hazard, so keep them away from heat and flame. You will achieve a much more professional looking result if you read manufacturers' instructions, practice with all sanders you are planning on using before beginning a project, and allow plenty of time for drying between coats of varnish. Refinishing a hardwood floor is often a project you can complete in a weekend if you are organized and have all of your materials ready. Take some time to learn your tools before you begin, and the job will go a lot easier. A newly refinished floor can add beauty and value to your home, and give you a great sense of accomplishment in the bargain.